Was our mangled mystery mammal a raccoon? We got more responses on this dead mammal quiz than on the last two dead bird quizzes combined! What’s going on Seanetters? Suffering from seabird burnout? In a participatory mood after the Thanksgiving holiday? Whatever the reason, thanks for offering your guesses. And SEANET’s answer is… perhaps. Alas, SEANET lacks dead mammal expertise and cannot say for sure. The carcass is quite bedraggled, but here are some clear characteristics: grayish fur, relatively long tail, hand-like paws and carnivorous type teeth. So we can rule out the rodent family (which have those big front teeth for gnawing and then a bunch of grinding molars.) Our mystery mammal definitely had canine teeth at one point. So we can rule out squirrels and muskrats and their ilk. 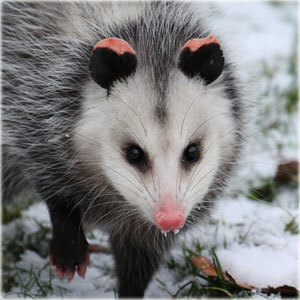 With hand-like paws and grayish fur, the most likely candidates are raccoon and opossum. 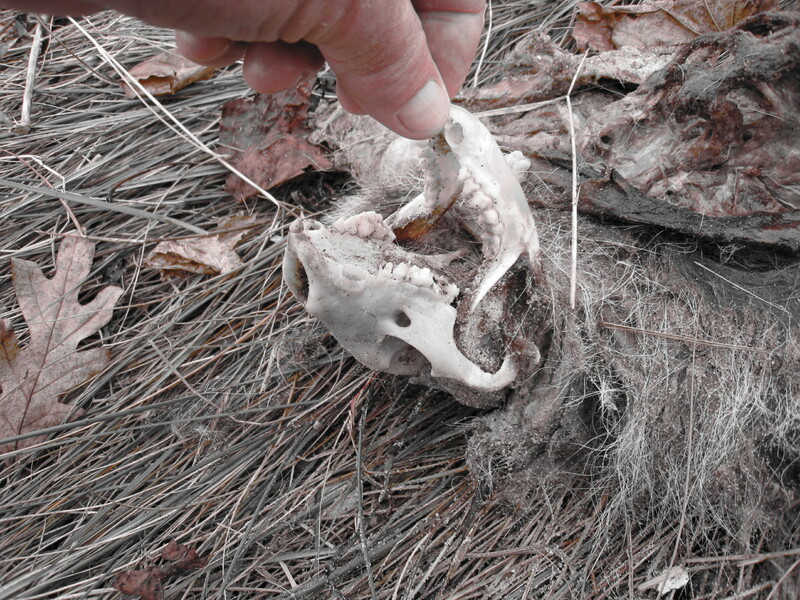 The skull is often the most helpful element in a carcass of this condition. Hugh Sokolski did a nice job documenting the teeth in this animal, showing the true Seanetter’s lack of hesitation in handling dead animals. It’s a little tough to see the animal’s profile, so SEANET is wussing out of a firm identification. 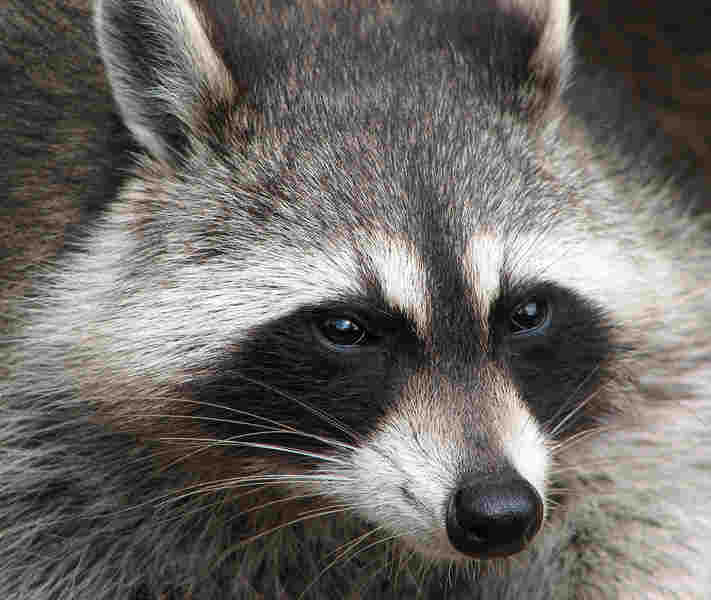 But based on the position of the infraorbital foramen (the divot below and forward of the eye socket) in the two candidate skulls, our carcass seems most like the raccoon. But SEANET is self-effacing and humble above all else, and will happily entertain arguments in favor of the opossum or other heretofore unconsidered mammal. 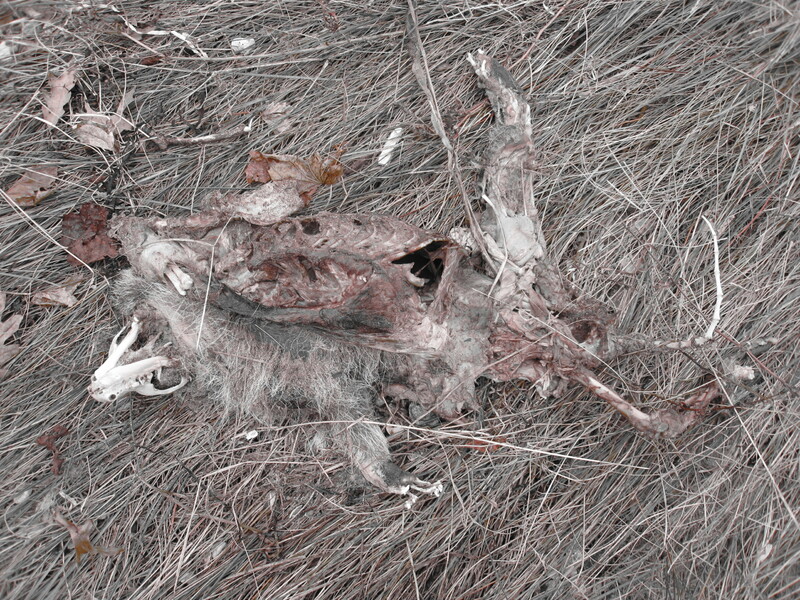 In any case, this carcass is evidence of mammalian scavengers on Hugh’s beach. You may come across a similar find on your beach, so SEANET argues that some non-avian carcass i.d. skills are beneficial to us all in our quests toward greater understanding of our coastal environments. 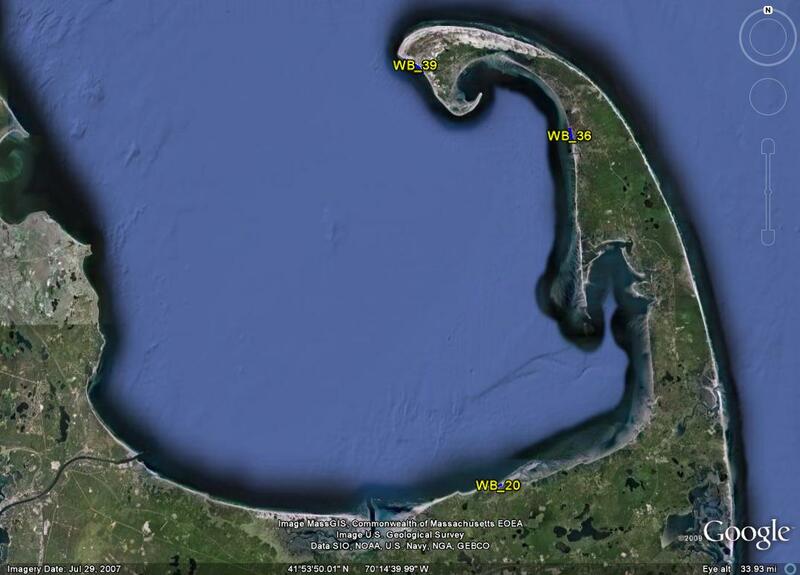 Keep the pictures coming Seanetters; we’re interested in all the weird/cool stuff you see out there! First off, to answer Jenette’s question on yesterday’s post, as far as I know, this is the USDA’s first foray into the Cape Cod eider die-offs. OF course, I have not been with the SEANET operation for many years, so perhaps their involvement predates my own. The Wildlife Disease program of the USDA frequently engages in similar field investigations, however, so this is certainly not their first rodeo, as it were. And now, to the main event: a dead mammal quiz. Yes, SEANET is a seabird operation, and the dead bird quizzes are near to all of our hearts. 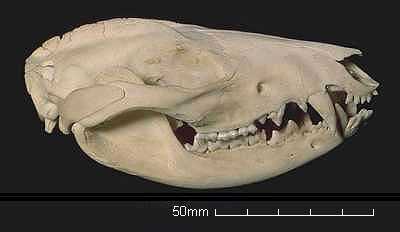 But here is an example of something equally dead, but decidedly mammalian. Since SEANET enjoys the study of all things dead, we invite you to take a look at this dead thing, found by Hugh Sokolski in Connecticut today. Any guesses? USDA sends superheroes on ATVs to investigate Eider die-off! USDA Wildlife Biologists came fully prepared for their mission on Cape Cod. 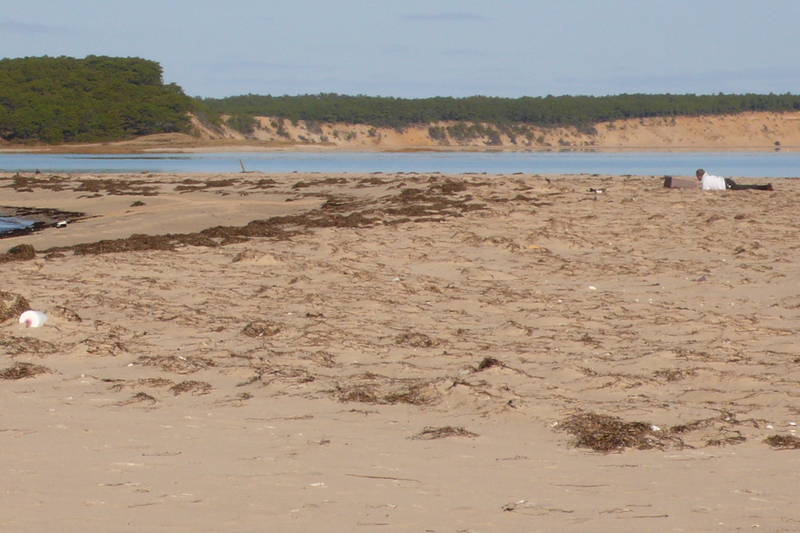 Wildlife disease biologist Randy Mickley and his boss, Monte Chandler, both with the USDA’s Wildlife Services Program, boldly ventured to remote Jeremy Point in Wellfleet, Massachusetts last week. Their mission: collect Common Eiders from the recent Cape Cod die-off for submission to the National Wildlife Health Center in Madison, Wisconsin. These intrepid adventurers came fully equipped with ATVs and very large nets. Using stealth and wiles, they managed to collect two freshly dead birds and one nearly dead bird. Monte Chandler stalks an eider. Moments later, he plunged into the ocean in pursuit of the elusive bird. These carcasses will be invaluable in the National Wildlife Health Center’s disease investigation, and SEANET is hopeful we may get a bit closer to an answer on these recurrent die-offs. As if the brave actions of theses two men last Wednesday were not enough, Randy returned on Friday to join SEANET’s new intern, Michelle Stantial of Massachusetts Audubon, on a carcass tagging adventure. The two worked in the rain, marking 200 carcasses before they exhausted their supply of cable ties. 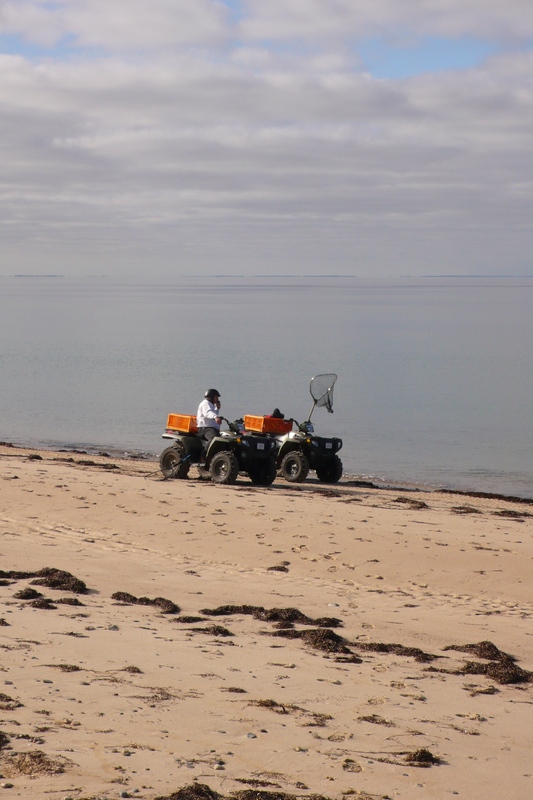 SEANET is excited to have reliable carcass counts at last, and is also interested in seeing if any of the marked carcasses ever make their way down to other SEANET beaches in the area. Some uplifting marine news (for a change). 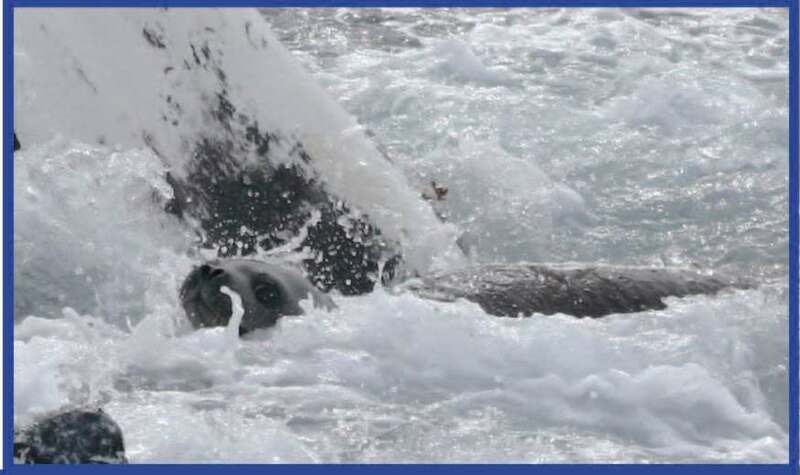 A seal benefits from the apparent compassion of a humpback. This is not seabird related, but Seanetters, I would like to think we feel a kinship with all things marine. So, I would like to share with you a heartwarming tale of interspecies altruism sent to us by volunteer Dennis Minsky. Rather than try to paraphrase the report, I recommend you all read the brief article for yourselves here. Albatross chick decomposing around the plastic that had filled its GI tract. As though you Seanetters were not already acutely aware of the plastic plight faced by marine life, here is some striking and troubling evidence of just how dire the plastic situation has grown for albatross chicks in the Pacific. 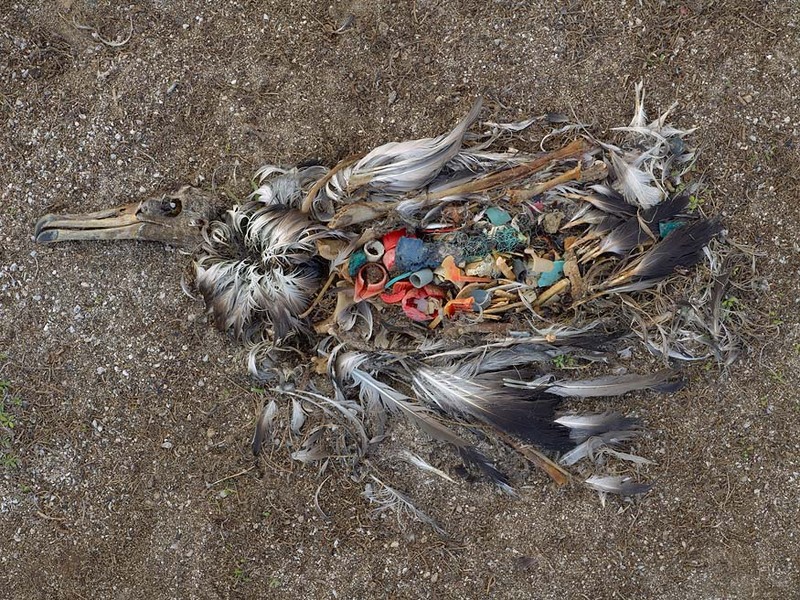 Photographer Chris Jordan traveled to the remote Midway Atoll in the North Pacific, thousands of miles from human habitation to document the young albatross, dead with bellies full of our discarded plastic. His work, called Midway: Message from the Gyre, is stunning, and though the subject won’t be new to Seanetters, the substance of these photos is terribly compelling. 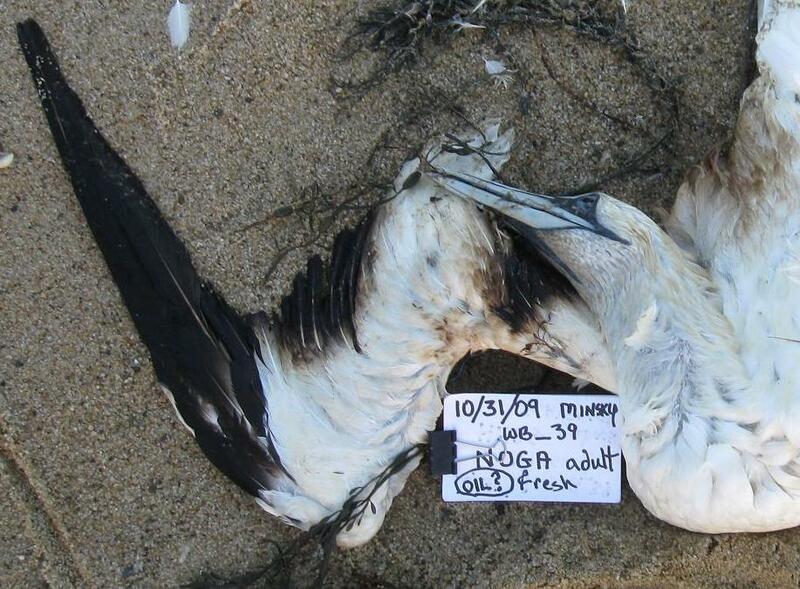 Northern Gannets washed up on three beaches on Cape Cod at the end of October. Seanet volunteers Jenette Kerr (WB_36), Dennis Minsky (WB_39) and Julie O’Neil (WB_20) all reported dead Northern Gannets on their Cape Cod beaches during the last week of October. While there was no evidence of a cause of death in the single birds found by Jenette and Julie, the eleven birds found by Dennis were a different story. Six or seven of the 11 Gannets showed some evidence of oiling on their feathers. While the oiling was not extensive, generally affecting small areas of the wings or breast, there is no question that this could have led to the deaths of these birds. Even a small area of oiling compromises seabirds’ waterproofing and can easily lead to hypothermia in a marine environment. The birds will also attempt to preen the oil off and can ingest it leading to fatal toxicosis. Without necropsies, no definitive diagnosis can be made. And it must be said that Northern Gannets typically begin turning up on beaches up and down the east coast at about this time, coincident with their southward migration. Certainly, some of these birds would have died anyway, but the number of birds seen so far this Fall is somewhat higher than we are accustomed to seeing. 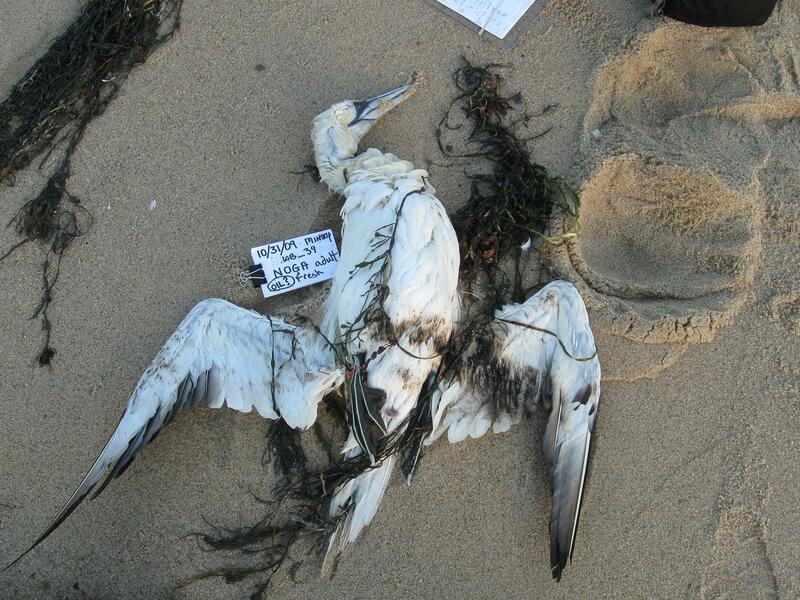 Additionally, we have received reports from non-Seanetters–concerned members of the public alarmed by the seemingly large number of dead gannets found on non-SEANET beaches. Those birds (perhaps a dozen in total) have also shown some faint traces of a black-brown substance that could be oil, though these photos are less definitive. Since no major spill event has been reported in the area, the affected birds were likely caught in a small, unreported spill, or even an illegal discharge of contaminated bilge water. We ask that all our Cape Cod readers, volunteers and friends alike, keep an eye out for more gannets washing up out there. This is a troubling and frustrating finding, but also a reminder of how important SEANET is; our volunteers are on the frontline of detecting this sort of event, and we appreciate all your work and dedication. Keep it up, even in the face of depressing news like this. You are making a difference, Seanetters! Cool study uses beached bird survey data! Lest you Seantters think you’re alone in your interest in seabird carcasses, here is some comfort and solidarity for you. The Monterey Bay group BeachCOMBERS surveys California beaches reporting on dead birds and marine mammals. Their techniques are very similar to SEANET’s, and many of the same questions have puzzled them in terms of how to interpret the data they collect. In particular, how do we know if seabird mortality observed by beach walkers reflects normal mortality in a population, or is an indicator of a major mortality event? The Common Eider die-offs on Cape Cod certainly beg this question, but without accurate data on live birds at sea, it’s impossible to determine the significance of a few dozen or even a few hundred dead birds on the beach. In Monterey Bay, Kelly M. Newton, Donald A. Croll, Hannahrose M. Nevins, Scott R. Benson, James T. Harvey, Bernie R. Tershy looked into that precise problem and have published a paper entitled “At-sea mortality of seabirds based on beachcast and offshore surveys” in Marine Ecology Progress Series. In their study, they examined the mortality data collected by beached bird survey volunteers in comparison with at-sea counts of various seabird species. In their model, they also took into consideration weather patterns, prey availability, migration and breeding status and various other factors that might impact mortality. Their findings vary across species of seabird, but indicate some intriguing links between ocean upwelling, prey availability and carcass deposition on the beach. SEANET finds this study fascinating and inspiring and we hope to ultimately do a similar study to elucidate some of the mysterious die-offs our diligent volunteers detect. Check out the paper and see what you think Seanetters. We think it’s time we started to catch up with the achievements of our west coast counterparts!